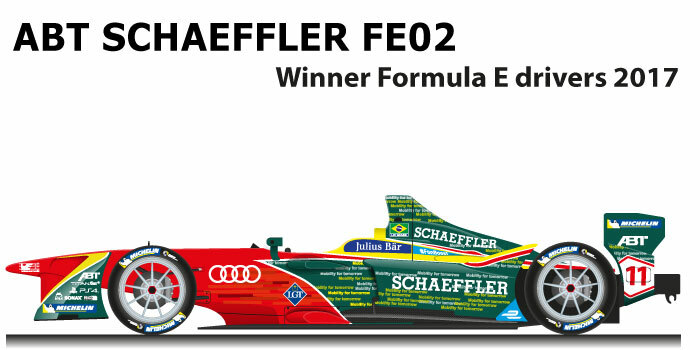 The ABT Schaeffler FE02 n.11 is the car that won the Formula E World Championship in the 2016/2017 season. After the defeat of the previous year the German team is among the favorites to victory and announces the collaboration with the official Audi from the 2017/2018 season. Lucas Di Grassi at the wheel of the ABT Schaeffler FE02 n.11 won the Formula E World Championship in the 2016/2017 season, winning his first drivers’ title. The season was marked by Buemi’s dominance with his Spark – Renault Z.E. 16 of the Renault e.dams team, but the Swiss driver was first forced to give up the two races in New York and then disqualified in the first race in Montreal, Di Grassi took advantage and overtake Buemi in the standings. Di Grassi in season won two races: Mexico City and the first race in Montreal. Posted in DRAWS FORMULA E.